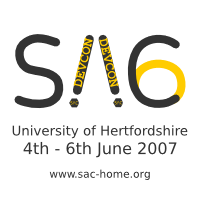 The programme of this year's SaC Developers' Conference can be found below. Please note that coffee breaks and time for discussions are implicit. Therefore, please allow at least 1/4 of your scheduled time for discussion. 16:00 - 17:00 Clemens Grelck What's the Problem with Multi-Threading? 9:00 - 10:30 Sven-Bodo Scholz How Lazy Should Efficient Array Programming Be? 10:00 - 11:00 Robert Bernecky Whither SAC or Wither SAC? Conference Hertfordshire offers Bed & Breakfast, conveniently located on the de Havilland campus. From there, the workshop location can be reached in 5 minutes using a frequent and free shuttle-bus service. The University B'n'B is now fully booked. Travelodge Hatfield Central offers budget en-suite rooms starting at 39£ a night. It is located close to de Havilland Campus. Premier Travel Inn Hatfield offers rooms starting at 49£. Being a bit further towards the town centre, it is still only a short travel from the workshop location. All meetings take place in room D102, College Lane Campus. For further directions, see the campus map and the general travel directions for the University of Hertfordshire.